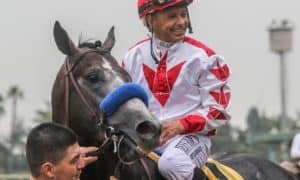 HALLANDALE BEACH, FL – It was the sweetest of swan songs for Mr. and Mrs. William Warren, Jr.’s City of Light on Saturday when the Breeders’ Cup Dirt Mile champion concluded his career in perfect form by romping home victorious in the Grade 1, $9,000,000 Pegasus World Cup Invitational Stakes at Gulfstream Park. 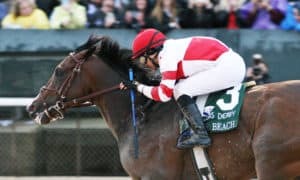 Breaking from post 3 under Javier Castellano at 9/5 odds, City of Light looked to have a shot at the early lead, but Patternrecognition – breaking from the far outside 12 post – was hustled hard to avoid going wide into the first turn. 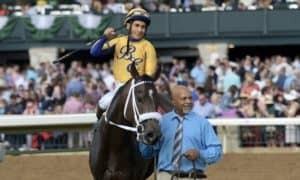 Realizing that Patternrecognition was hell-bent on setting the early pace, Castellano waited until he was in second, then crossed City of Light over from the rail into the clear so that they weren’t directly behind the pacesetter’s kickback. 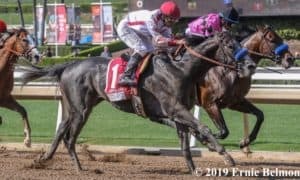 Cruising comfortably down the backstretch through opening fractions of :23.23 and :46.84, City of Light slowly inched up alongside Patternrecognition until he was at his throat latch at the top of the far turn. 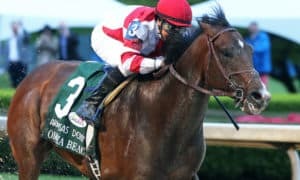 Knowing the time was now or never, Catellano allowed City of Light to begin drawing off, but the 3/2 favorite and recent Breeders’ Cup Classic champion Accelerate made his bid in mid-turn. A shake of the reins was all it took for City of Light to take off, and by the top of the stretch, he looked to be much the best by a mile. Under a confident hand ride while the crowd cheered and roared, City of Light’s final career race concluded with a dominating 5 3/4-length advantage in a final time of 1:47.71 for the 1 1/8-mile event over the sloppy (sealed) main track. Longshot Seeking the Soul was able to grind out a gutsy stretch run to usurp Accelerate for second. Following the race, trainer Dallas Stewart was pleased with the effort. 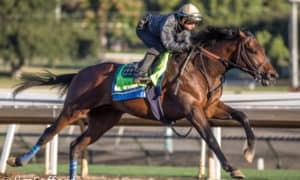 City of Light wasn’t the only horse making his final appearance on the track. 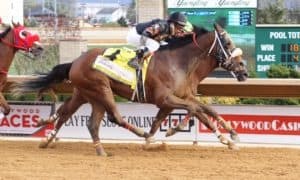 Like the winner, Accelerate is headed to Lane’s End Farm for stud duties following an accomplished career that ended with a record of 23-10-5-6 and $6,692,480 bankrolled. While disappointed that he wasn’t able to win, trainer John Sadler was nonetheless upbeat. 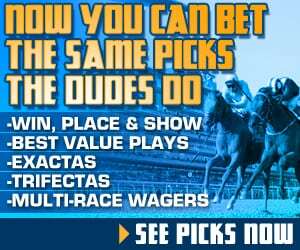 Heading into the race, many handicappers expected Bravazo, Audible, and Gunnevera to be in the mix for the underneath plays, which happened to also be how they crossed – fourth through sixth. The rest of the field was spread about far behind them. 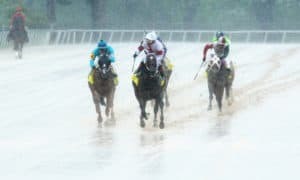 True Timber took seventh over Imperative, while Tom’s d’Etat, Something Awesome, Mexican Triple Crown winner Kukulkan, and an eased Patternrecognition completed the order of finish. 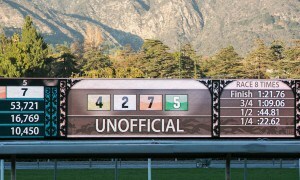 City of Light’s win was his second straight and puts a deafening stamp on a career that features a record of 11-6-4-1. The 5-year-old son of Quality Road will soon join his sire at Lane’s End after amassing $5,662,600 in his lifetime. City of Light returned $5.80 to win, $4.20 to place, and $3 to show. 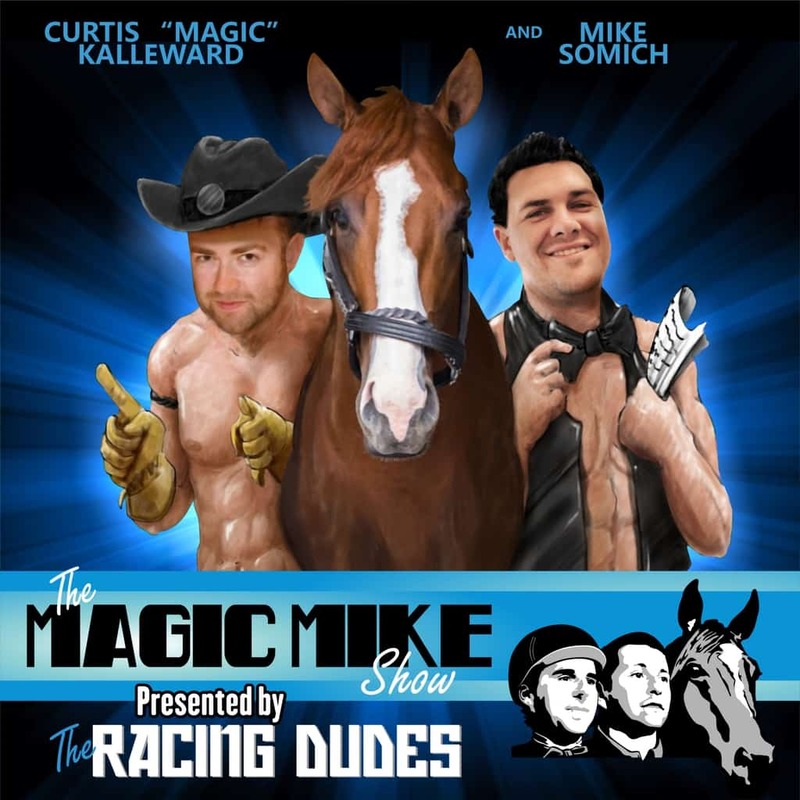 Seeking the Soul brought back $19.20 to place and $8.20 to show, while Accelerate paid $2.80 to show.